Diarmaid Doherty in the comfort of the press box at a cup match in Dublin. There’s a certain irony in the fact that the Leaving Certificate exams started this week, and it’s exactly 25 years since I took up a full-time position as a reporter with the Donegal Democrat. That’s because I’m not sure I always wanted to be a journalist. Thing is, I really liked the idea of being a teacher. Had I performed a bit better in my Leaving Certificate in 1991, would I now be standing in front of a classroom of primary school children? In fairness, I wanted to be a journalist too. As a young boy, encouraged by my mammy, I read books by the bucketload. I read football magazines too. My dad got the Irish Independent every day. I’d read it too. I was working then in Clarke’s Newsagents (Bella’s) in Letterkenny. They were brilliant days, working with shop owner Paddy Delap, and on a Sunday morning, Noel McGlinchey. It was my first real grounding in life. I met some fascinating characters and was intrigued by how people followed an almost daily routine which included calling into Bella’s for their 20 Silk Cut Purple and Daily Record. I could still tell you what papers our many customers used to read - and probably still do. By 18, I went from selling the paper, to writing for one. I got a start in the Democrat during the summer of ‘92 and following the Bank Holiday weekend in June the following year, I took up a full-time position in our Ballyshannon office. It was a big deal in the Doherty household. My parents were proud as punch. I was a bit nervous. Annette O’Donnell, a journalist from Letterkenny, was leaving the Demo to join North West Radio. Seamus McBride, who had looked after me so well during my short time in our Letterkenny office, had given me the news that the editor, John Bromley, wanted a wee chat with me. Annette’s job was mine if I was interested. Michael Daly was the Sports Editor back then. I’d got to know Michael in the months beforehand, covering the odd match and helping out with the Democrat’s coverage of Donegal’s march to All-Ireland success in 1992. We’d spoken on the phone a few times, but had never met until the evening before the All-Ireland semi-final in Dublin. Michael and Peter Campbell were outside the Harcourt Hotel and there was me saying hello in my Oxblood Doctor Martin’s, skinhead and flight-jacket. I’m not sure what they made of me. Back then, Peter was part of the type-setting team in the Ballyshannon office and along with Thomas Gallagher (now the Democrat’s photographer), big Sean Keenaghan and Thomas Downey, Peter took me under his wing. I remember asking Peter about the stash of newspapers he kept beside his desk. It was a pile that would grow from week to week, and was mainly made up of the Monday editions of the Times or Independent. He told me it was his way of keeping stats and scores involving the teams that Donegal might play later in the year. A vital help when sitting down to write a match preview. There was no Google back then. In fact life in a local newspaper was very different. It was a real team effort in the Democrat where every single member of staff contributed to a paper which was printed on site in Ballyshannon shortly before lunch-time every Thursday. I have a fond memory of showing my parents around my new working surrounds when they stopped off in Ballyshannon on the road home from Mayo one day. I remember introducing them to my work colleagues and showing my father how the whole place operated. We went for soup and sandwiches afterwards in Sean Og’s. They’re nice memories to have. I worked in Ballyshannon for four years. I celebrated my 21st there in Melly’s Bar. Deborah Kerr, who later became Deborah Doherty, came down on Feda’s bus from Letterkenny and along with Thomas Gallagher we went out for a few drinks. I drank brandy that night, and haven’t touched it since. There were a few changes within the company shortly after that. The Derry Journal took over the Democrat and suddenly we had new owners. I was moved back to our Letterkenny office and within a short time, there were further changes with more different owners. The newspaper industry was a changing world, and the Donegal Democrat, like so many established papers in Ireland, was a much sought-after title. But amidst all those changes, and there were many, stories still had to be written. Events were covered. The life of a local newspaper reporter might not be for everyone. It’s not easy being asked to cover a local court sitting, where you’re asked to report on someone’s demise. Often the defendant can be someone you know. It’s never nice attending a Coroner’s Court, or ringing a family member or friend when you sit down to write about a local death. There have been many tragedies and heartbreaking stories to report on over the years. And some memorable events too. I remember standing interviewing Gerry Kelly outside the Clanree Hotel in Letterkenny when the IRA were announcing their ceasefire of ‘94. It was an historic event in our time. Bishop Edward Daly also played no small part in the Peace Process. He performed the official opening of a newly refurbished primary school in Quigley’s Point around then and along with our photographer, Brian McDaid, I was sent along. Brian still reminds me how afterwards, I started giving out that someone was eating all the sandwiches, not realising that Bishop Daly was beside me, and was sharing my plate! Election time is always a great time to be a local reporter. I’ve always loved covering the local and national elections. Over the years, you come to realise that no election is ever the same. I often smile to myself when the ‘experts’ try to call an election or referendum. Each to their own, but I’ve learned from my time as a reporter to always expect the unexpected. Covering sport has also been a big part of my journalistic career. Again, there have been good days and bad, but it’s always been a labour of love. 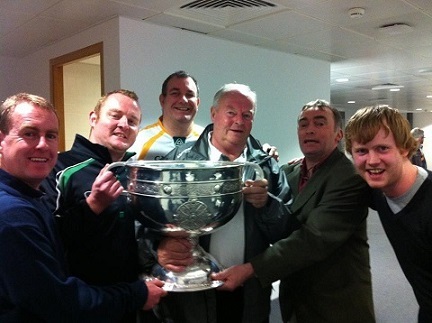 A special night in Croke Park when County Board Chairman PJ McGowan brought Sam Maguire to the press area shortly after Donegal's 2012 All Ireland Final win over Mayo. 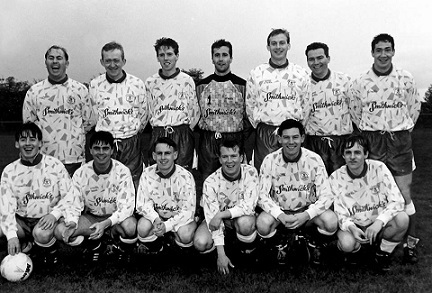 Included are Diarmaid Doherty, Alan Foley, Michael McHugh, Gerry McLaughlin and Aidan O'Donnell. I remember the first game I ever reported on involved Donegal Youths against Mayo Youths back in 1992. It was a bitter-sweet game for me - my first as a reporter, but I was pretty annoyed that I didn’t make that Donegal squad! Again, sport is all about opinions. I’m paid to give mine, and I’m all too aware that there have been reports and comments written over the years that haven’t gone down well in all quarters. Again, as Ciaran O’Donnell used to tell me, that’s part of the gig. Managers and players come and go, but sports reporters tend to outlast them. Still, sometimes it’s nice to be appreciated. And I think one of the nicest moments in my career in journalism came about an hour after Donegal won Sam under Jim McGuinness in 2012. I was sitting on the laptop in the press area, way up high in Hogan Stand at Croke Park when the door to the room opened and in came PJ McGowan carrying Sam Maguire. He’d gone up to the press room especially so the Donegal reporters could have their photo taken with Sam. It was a lovely gesture. After all, we all were, and still are, Donegal fans, with a notebook and pen.